Reduce Risk for Cardiovascular Disease and Cancer. Highest quality and best-selling odorless Sociable Garlic; Original Formula CARDIOVASCULAR; Supports your cardiovascular system by maintaining circulatory function and overall heart health. Garlic has been proved to lower blood pressure and reduce the risk for cardiovascular disease and cancer. It also stimulates immune function and restores physical strength. One tablet/capsule provides 600mg aged garlic extract powder, gelatin, whey (derived from milk) and 5mg magnesium stearate (vegetable source). Free of: sodium, yeast, preservatives, sugar, gluten, artificial colours or flavours. Suggested Use: Take one or more caplets with a meal twice daily. 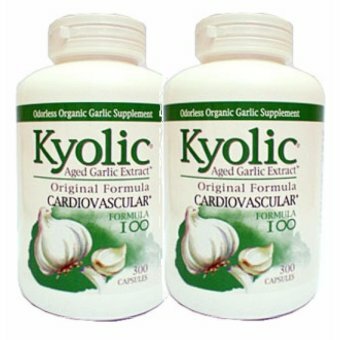 Take the best - Kyolic Aged Garlic Extract, the most scientifically researched, highest quality and best-selling odourless Sociable Garlic.